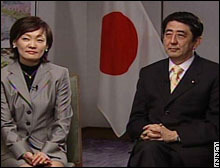 (CNN) -- In a rare international television interview Japanese Prime Minister Shinzo Abe sits with TALK ASIA's Anjali Rao ahead of his much talked-about and 'delayed' first official trip to the United States. He discusses Japan's current relationship with the U.S., the issue of "comfort women," his stance on North Korea, and Japanese domestic issues including changing the constitution and the economy. His popular wife, likened to U.S. presidential candidate and former first lady Hillary Clinton, also joins him to chat as she reveals her fondness for Korean pop culture. Anjali Rao (AR): Prime Minister Abe, I will come to you first. Mrs. Abe, we will have a chance to talk more in the second part of the show. Prime Minister, I just want to ask first of all, you are off to the U.S. in a couple of days, what do you want to accomplish there? Shinzo Abe (SA): The Japan-U.S. alliance is an irreplaceable alliance. And I would like to further consolidate and broaden that alliance. To do that, I need to further build a relationship of trust with President Bush, so that, I believe, will be the trip this time. I believe that showing that the Japan-U.S. alliance is unshakable to people here in Japan as well as outside, will lead to more peace and stability in the region, as well as around the world. AR: One of the strongest pieces of evidence as to the close relationship between the U.S. and Japan has been your cooperation in Iraq. The U.S. asked you for help, and this country obliged. What more do you think that Japan can do to help in Iraq's reconstruction? AR: If and when that comes up, how would you respond? SA: As a human being and also as Prime Minister of Japan, I sincerely sympathize with the women who, back in those days, really experienced hardships, having been forced to serve as comfort women. The 20th century was a century when human rights were violated in many parts of the world, and of course Japan did not remain aloof in that regard either. And, I do also harbor a sense of apology to the women who found themselves in that situation, in other words, of being comfort women. And I believe that we need to strive to make the 21st century a century in which human rights will not be violated. And to that end, I, and also Japan will need to play its proper role. AR: Mrs. Abe, I can see you nodding there at what your husband had to say there on that issue. What's your take on it as a woman? What do you feel about the comfort women situation, which continues to this day so many decades after the war? Akie Abe (AA): As a woman, I do sympathize wholeheartedly with the people who had to serve as comfort women. And, in fact, it really pains my heart. AR: When people were criticizing the Prime Minister, when they thought that the Prime Minister had said that there was no proof, not enough evidence to support the allegations of women being forced into sexual slavery to serve the Japanese military -- that was a few weeks ago now, I believe. What was going through your mind then when he was getting, really, severe opposition because of those comments? AA: Well, I actually had not heard about that statement he made, so I am not entirely clear about that. But, my understanding is that he has been saying he is sorry for that situation. AR: Prime Minister, the last time that Talk Asia spoke to you, your approval rating was up around 70%, and granted since the recent visit here by Chinese Premier, Wen Jiabao, your popularity ratings do seem to be climbing back up. But, in the interim, they plummeted quite severely; they were down around 30%. Your predecessor, Junichiro Koizumi, used to fix his plummeting domestic ratings by visiting the Yasukuni war shrine. Is that something that you would consider? SA: Well, my approval rating has been at a high of 70% perhaps down to 40%, now it stands at around 55%. Approval ratings are such that by nature it does climb up and climb down. During the Koizumi administration, I served as the Deputy Chief Cabinet Secretary as well as the Chief Cabinet Secretary. I remember that Prime Minister Koizumi's approval ratings rose and slipped as well. To serve as Prime Minister while being too mindful of the approval rating is like serving as a Prime Minister on a roller coaster. What is important I believe, is that I really act on promises that I make and leave results. Leave a track record and show that to the Japanese public, who will, at the end of the day, I hope, appreciate it. The visits Prime Minister Koizumi made to the Yasukuni Shrine, I believe, had nothing to do with approval ratings. He paid respects at the Yasukuni Shrine to pay respects to the people of Japan who fought and lost their lives for the country and to pray for the peace of their souls. In fact, I believe, to visit the Yasukuni Shrine for the purpose of having your approval rating up will be an affront to the people who lost their lives for the country. AR: You still haven't said though whether you're going to go? SA: As I've been saying ever since the days when I was the Chief Cabinet Secretary, I will not declare whether I will visit or not, since this issue is going to turn into a diplomatic and political issue. AR: Isn't that exactly why you should clear it up now? SA: I don't think there's a need to make it clear, in fact, it is solely a matter of the heart. AR: You've also said that you want to revise Japan's pacifist constitution. How much has the situation on the Korean Peninsula with particular respect to Pyongyang played into your desire to conduct that review? SA: I believe changes in the international situation, changes in the security environment surrounding us, do play a part in the attempt to revise the constitution. With that said, I've been explaining that there are three reasons for the idea that we need to revise the constitution. The first is that the current constitution was drafted at the time when Japan was under occupation. And the second is that 60 years have passed since the constitution was promulgated, and we now see parts of the constitution that do not necessarily fit the times. And also, new values have emerged in the meantime. And the third is that, I believe writing our new constitution ourselves will in fact lead to the spirit of trailblazing a new era. And I would like to see to it that the constitution will be amended within my term of office. AR: On the North Korean situation though, do you think that it really is a threat to Japan? SA: If the North Koreans possess nuclear weapons, they have the means of delivery, which is the No-dong missile. Therefore, that capability clearly will be a threat to Japan. And it is specifically in response to that, that the Self-Defense Forces of Japan and Japan-U.S. alliance would be meaningful. AR: You met North Korea's leader, Kim Jong Il, in 2002 when you were Foreign Secretary. Not many people can say that. What struck you the most about him? SA: I felt that Mr. Kim Jong Il is a person who is capable in certain respects of rational thinking. And also the impression I got was that he was in fact a man in control in North Korea. AR: Interesting, because that's what former South Korean President, Kim Dae Jung, also told me when I asked him a similar question to that. But, then to the rest of the world, a lot of people look at Kim Jong Il and say, you know, "This guy's a madman." Where do you think the rest of the world is getting it wrong? SA: I believe that clearly the direction that North Korea is headed today is wrong. But if you look at North Korean diplomacy to date, you will find that there is one logic that runs through it. And that is, to acquire enough capability to draw the United States to the negotiating table, and negotiate with the United States on equal footing. And they conducted the nuclear test for that very purpose. In fact, with that policy of North Korea, back in 1994, the United States and North Korea engaged in negotiations and produced the so-called agreed framework. Which means that I regard Mr. Kim Jong Il as a person who is capable of rational thinking, which also brings me to say that I believe a policy of dialogue and pressures vis-à-vis North Korea would be effective. AR: Welcome back to this edition of Talk Asia. My guests today are Japan's Prime Minister Shinzo Abe and the First Lady Akie. Let me just first talk about your popularity, because your husband's has fluctuated rather a lot of late and yours seem to be going through the roof. Why do you think that is? AA: Well, I myself do not feel that I am that popular but, well, I suppose until recently we had Prime Minister Koizumi, who did not have a wife, and so as the first prime minister's wife in a long time, perhaps people feel happy because of that and perhaps because I am relatively young. AR: You hold hands in public in a place where first ladies traditionally walk two steps at least behind their husbands and you are a bit of a trendsetter where conservatism rules. Some say it's all a big ploy to help your husband in the popularity stakes. Is it? AA: Well, in my mind I am here thanks to my husband. So at least I think I am trying to walk 2 or 3 steps behind him. But as I have been saying to many people, I would also like to appeal to the public with an image of youth. In fact, at the inauguration of President Clinton I saw him holding hands with Mrs. Clinton and I thought it was pretty cool. Which is why I walked down the aircraft holding my husband's hand. SA: As she said that as a matter of attitude of mine, she tries to remain 2 or 3 steps behind me, in reality that doesn't happen. And if I seem to be two or three steps ahead of her, it's because I'm walking at a brisk pace. AR: You've been called the Japanese Hillary Clinton, and you've already made friends with the current first lady of the U.S., Laura Bush. Have you been able to learn anything from your western counterparts? AA: First of all, I think that I am a totally different type of person compared to Hillary Clinton. And I think I really do not deserve to be compared with such a capable person. In Vietnam, I had the pleasure of meeting with Mrs. Bush, Laura Bush, and had a meal together with her. She is a wonderful person and I learned a lot from her over the meal. It was pretty soon after my husband had become Prime Minister and I really didn't know what to do, and she told me, well, do the things that you are most interested in. AR: You are a role model for young females in Japan. So let me just ask you a couple of issue questions. What's your take on the increasing number of women here who are choosing to remain single and not have children, given the declining birth rate in Japan? AA: Let me say, that I am no role model for young women in this country. If women who choose not to have children do so, because they see a choice between work or child and they decide to choose work, I think we need to create more work that will enable women to juggle both work and child bearing. And also we need to improve child care facilities like nursery schools and so on. AR: How great do you think the social pressure here is for women to have children, particularly male children, especially when we've seen the terrible amount of strain it's put on Crown Princess Masako, for example? AA: Well, I think the Imperial family is a totally separate issue. But I really wonder if current Japanese society is such that there is all that pressure on women to bear children, especially boys. AR: What about the concept of adopting in a place that does have a very low birth rate like Japan? Not many people seem to be keen to do that at all. Why do you think that is, is there some sort of stigma about it? AA: In the past we also had in Japan the practice of adopting relatives, especially in the case of childless families. But I really doubt if there is any strong awareness in this country of really needing to keep on the family line. But it's true, the practice of adopting children from other families, or from child care facilities, orphanages and so on, is not prevalent in this country like in the United States and other countries. I do visit child care facilities and orphanages and so on, and many of the children there are not really children who have lost their parents, but they are kept in those facilities, because of domestic violence, child abuse and so on. So perhaps there are some difficulties in terms of adopting children in this country. AR: Mrs. Abe, while your husband is busily mending fences across Asia with Japan's neighbors, you've been really getting into Korean pop culture. What's the fascination? AA: It is not just myself but many Japanese women, and in fact, it's not just Japanese women, but I think many Asian women seem to have become great Korean drama and movie buffs. I don't know what really most fascinates me, but I think Korean dramas and movies are straightforward, which is reminiscent of Japanese dramas and movies some time ago. And I sense, this is perhaps my own feeling, but Korean male stars seem to be more manly than Japanese men. AR: If you say so. I just want to get a picture of what it's like for both of you now as Japan's first couple. Do either of you think that the other has changed at all? SA: My sense is that my wife has not changed at all. And probably things will stay that way from here on as well. In fact, my wife has not changed at all from before I became a politician to after I became a politician, and even after I became prime minister. One thing I might point out though, because of increased work load for both of us, we have less time together. AR: Yeah, that's what I was going to ask next. For you two, is it ever not about politics? Can you ever just sneak off into the mountains and be a normal couple? SA: That's an ideal of sorts, but I believe it would be very difficult to do that now. Right now, if I were to venture out, then of course there is the need for security, and also people find us and come around us, so it is not possible to behave as just as an ordinary couple. But I am sure that time will come when I leave this office. AR: Mrs. Abe, what is the hardest thing for you watching your husband in obviously an incredibly high-pressure job like this? AA: It is certainly hard for me to see him being criticized in weekly magazines or on TV. But he does not really bring those things into our home. In our home, he really behaves as if there is no stress. AR: Thank you both for your time. It's been a great pleasure meeting you both.